Overall, we see the CleanIT project as a misguided effort to introduce potentially endless censorship and surveillance that would effectively turn Internet companies into Internet cops. We are also disappointed in the European Commission for funding the project: Given the strong legal protections for free expression and privacy contained in the Charter of Fundamental Rights of the European Union [PDF], it’s imperative that any efforts to track down and prosecute terrorism must also protect fundamental rights. The CleanIT regime, on the other hand, clearly erodes these rights. The New York Times’ September 26 coverage of Barack Obama’s UN address on Arab democracy, free speech and violence included a good sampling of the distortions, double standards and bigotry often present in U.S. corporate reporting on these issues. Let’s begin with “anti-American violence in the Muslim world.” Does it even approach the level of violence visited on Muslim countries by the U.S.? No. Not even close. It would have been good for the Times to mention this. It would also have been helpful if Cooper and the editors had explained that the U.S. actually has a horrendous record when it comes to supporting free-speech and democracy in the Muslim world. The U.S. currently supports and arms autocratic and free-speech averse regimes in Saudi Arabia, Yemen, Bahrain, Qatar and the United Arab Emirates. Until recently, Tunisia and Egypt were U.S.-backed dictatorships. One might argue that the U.S. no longer overtly thwarts free speech and democracy in Tunisia, but that’s a harder case to make for Egypt, whose military the U.S. has continued to fund through decades of torture, detention and disappearances. Not even military crackdowns after the 2011 Tahrir Square uprisings or the dissolving of Egypt’s democratically elected parliament by its military allied supreme court in June interrupted of the flow of money from Washington to the Egyptian generals. Indeed, following the Egyptian spring uprisings, Washington pushed Egypt’s former “vice president” Omar Suleiman, otherwise known as “the CIA’s man in Cairo” and Egypt’s “torturer-in-chief,” to head the Egypt’s supposed transition to democracy (Guardian, 2/5/11). The Times might also have mentioned that the administration doesn’t have a pristine record on free speech at home either, where it has conducted a record number of prosecutions against government whistleblowers. “While I appreciate the response from the Justice Department, ultimately, they fail to examine key questions and discrepancies. It is well known that an FBI informant, Terry Norman, was on the campus. That FBI informant was carrying a gun. Eyewitnesses testified that they saw Mr. Norman brandish that weapon. Two experts in forensic audio, who have previously testified in court regarding audio forensics, found gunshots in their analysis of the audio recording. Did an FBI informant discharge a firearm at Kent State? Did an FBI informant precipitate the shootings? “Whether due to miscommunication, embarrassment or an attempted cover-up, the FBI initially denied any involvement with Norman as an informant. LAUREL KRAUSE a writer and truth seeker dedicated to raising awareness about ocean protection, safe renewable energy, and truth at Kent State. She publishes a blog on these topics at Mendo Coast Current. She is the cofounder and director of the Kent State Truth Tribunal. Before spearheading efforts for justice for her sister Allison Krause, who was killed at Kent State University on May 4, 1970, Laurel worked at technology start-ups in Silicon Valley. 1. For more background on Kent State and the many conflicting interpretations, see Scott L. Bills, Kent State/May 4: Echoes Through a Decade (Kent OH: Kent State University Press, 1982). Of particular interest for background on this chapter, see Peter Davies, “The Burning Question: A Government Cover-up?,” in Kent State/May 4, 150–60. For a full account of Davies’s work, see The Truth About Kent State: A Challenge to the American Conscience (New York: Farrar, Straus & Giroux, 1973). For a listing of other works see Selected Bibliography on the Events of May 4, 1970, at Kent State University, http://dept.kent.edu/30yearmay4/source/bib.htm. 2. 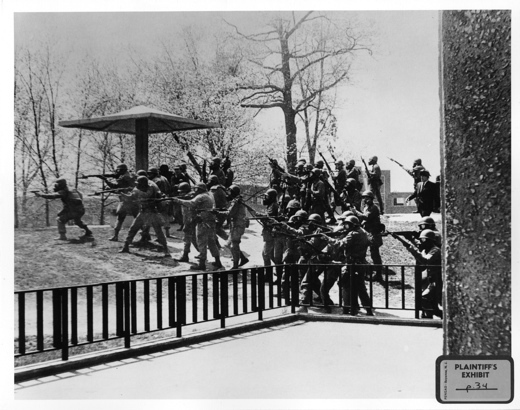 John Mangels, “New Analysis of 40-Year-Old Recording of Kent State Shootings Reveals that Ohio Guard was Given an Order to Prepare to Fire,” Plain Dealer (Cleveland), May 9, 2010, updated April 23, 2012, http://blog.cleveland.com/metro/2010/05/new_analysis_of_40-year-old_re.html; Interview with Stuart Allen analyzing new evidence who said of the efforts, “It’s about setting history right.” See the footage “Kent State Shootings Case Remains Closed,” CNN, added April 29, 2012, http://www.cnn.com/video/?/video/us/2012/04/29/justice-department-will-not-reopen-kent-state-shootings-case.cnn. 3. Submitted for the Congressional Record by Representative Dennis Kucinich, “Truth Emerging in Kent State Cold Case Homicide,” by Laurel Krause, http://thomas.loc.gov/cgi-bin/query/z?r111%3AE14DE0-0019%3A. For a brief introduction on the history and emerging historiography of the Kent State shootings, see Mickey S. Huff, “Healing Old Wounds: Public Memory, Commemoration, and Conflicts Over Historical Interpretations of the Kent State Shootings, 1977–1990,” master’s thesis, Youngstown State University, December 1999, http://etd.ohiolink.edu/view.cgi?acc_num=ysu999620326. 4. Mangels, “Kent State Tape Indicates Altercation and Pistol Fire Preceded National Guard Shootings (audio),” Plain Dealer (Cleveland), October 8, 2010, http://www.cleveland.com/science/index.ssf/2010/10/analysis_of_kent_state_audio_t.html. 5. Kent State Shooting 1970 [BX4510], Google Video, at 8:20 min., http://video.google.com/videoplay?docid=-3727445416544720642. 6. Editorial, “Kent State: The Politics of Manslaughter,” Nation, April 30, 2009 [May 18, 1970], http://www.thenation.com/article/kent-state-politics-manslaughter. 8. John Kifner, “4 Kent State Students Killed by Troops,” New York Times, May 4, 1970, http://www.nytimes.com/learning/general/onthisday/big/0504.html#article. 11. “My Personal Testimony ROTC Burning May 2 1970 Kent State,” YouTube, April 28, 2010, http://www.youtube.com/watch?v=6ppBkB4caY0&feature=youtu.be; Freedom of Information Act, FBI, Kent State Shooting, File Number 98-46479, part 7 of 8 (1970), http://vault.fbi.gov/kent-state-shooting/kent-state-shooting-part-07-of-08/view. 12. The Project Censored Show on The Morning Mix, “May 4th and the Kent State Shootings in the 42nd Year,” Pacifica Radio, KPFA, 94.1FM, May 4, 2012 live at 8:00 a.m., archived online at http://www.kpfa.org/archive/id/80293 and http://dl.dropbox.com/u/42635027/20120504-Fri0800.mp3. For Wellin on ROTC, see recording at 28:45. 13. The Assassination Archives and Research Center (AARC), “Volume 2: Huston Plan,” http://www.aarclibrary.org/publib/contents/church/contents_church_reports_vol2.htm. 14. Associated Press, “Kent State Settlement: Was Apology Included?,” Eugene Register-Guard, January 5, 1979, http://news.google.com/newspapers?nid=1310&dat=19790105&id=xvJVAAAAIBAJ&sjid=BuIDAAAAIBAJ&pg=3696,963632. 15. Mangels, “Justice Department Won’t Reopen Probe of 1970 Kent State Shootings,” Plain Dealer (Cleveland), April 24, 2012, http://www.cleveland.com/science/index.ssf/2012/04/justice_department_wont_re-ope.html; and kainah, “Obama Justice Dept. : No Justice for Kent State,” Daily Kos, May 2, 2012, http://www.dailykos.com/story/2012/05/02/1086726/-Justice-Dept-No-Justice-for-Kent-State. 17. Letters between the Department of Justice and Representative Dennis Kucinich, archived at the Congressman’s website, April 20 and April 24 of 2012, http://kucinich.house.gov/uploadedfiles/kent_state_response_from_doj.pdf and http://kucinich.house.gov/news/documentsingle.aspx?DocumentID=292306. 18. Mangels, “Kent State Shootings: Does Former Informant Hold the Key to the May 4 Mystery?,” Plain Dealer (Cleveland), December 19, 2010, http://www.cleveland.com/science/index.ssf/2010/12/kent_state_shootings_does_form.html. 21. Steven Rosenfeld, “Will a Militarized Police Force Facing Occupy Wall Street Lead to Another Kent State?,” AlterNet, May 3, 2012, http://www.alternet.org/rights/155270. 23. Laurel Krause, “No More Kent States,” Mendo Coast Current, April 21, 2012, http://mendocoastcurrent.wordpress.com/2012/04/21/13-day-for-kent-state-peace. 24. Laurel Krause, “Unjustified, Indefensible, Wrong,” Mendo Coast Current, September 13, 2010, http://mendocoastcurrent.wordpress.com/2010/09/13/unjustified-indefensible-wrong. 25. Associated Press, “Bloody Sunday Report Blames British Soldiers Fully,” USA Today, June 15, 2010, http://www.usatoday.com/news/world/2010-06-15-Bloody-Sunday-Ireland_N.htm; and Cameron’s direct quote from Henry McDonald, Owen Bowcott, and Hélène Mulholland, “Bloody Sunday Report: David Cameron Apologises for ‘Unjustifiable’ Shootings,” Guardian, June 15, 2010, http://www.guardian.co.uk/uk/2010/jun/15/bloody-sunday-report-saville-inquiry. 26. Laurel Krause, “To the Hague: Justice for the May 4th Kent State Massacre?,” Mendo Coast Current, May 7, 2012, http://mendocoastcurrent.wordpress.com/2012/05/07/may-4th-kent-state-massacre-a-call-for-truth-justice; for more on the Kent State Truth Tribunal, see www.TruthTribunal.org. BETHLEHEM – Donations to a Norwegian organization that funds illegal Israeli settlements will no longer be tax-deductible following a decision by the Norwegian government. The Norwegian Ministry of Finance announced the decision to remove Karmel-instituttet from the list of organizations eligible for tax-deductible donations on Thursday under pressure from Norwegian People’s Aid and the Norwegian Union of Municipal and General Employees, NPA said in a statement. “We are very pleased that the Ministry of Finance has made this decision, based on the fact that Karmel provides funds to the illegal Israeli settlements,” said Liv Tørres, the secretary-general of NPA. The Norwegian Ministry of Finance said they intended to ensure the system of tax deductions did not benefit organizations that actively support or contribute to acts that are in contravention of international law, NPA added. According to the groups, Karmel-instittuttet had funded three study centers and around half the homes in the illegal Alonei Shilo settlement. That settlement is illegal under both international and Israeli law. NABLUS – Israeli forces on Wednesday detained two Palestinians who were attacked by a mob of settlers south of Nablus, locals said. Iyad Rashdan and Muhammad Allan were picking olives in fields of Einabus village when a group of settlers attacked them. 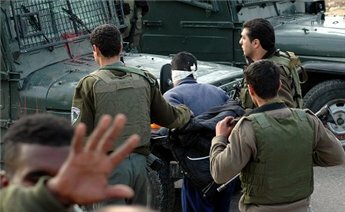 Israeli forces arrived and detained the two Palestinians, locals told Ma’an. An Israeli military spokeswoman was not familiar with the incident. Earlier dozens of settlers from Migron outpost assaulted a farmer north of Jerusalem, leaving him with multiple injuries, local officials said. “Dozens of settlers chased the farmer, Abed al-Kareem Maikel Abu Ali, 57, for about 500 meters and beat him with iron bars, stones and sticks,” activist Saed Allah Khaled Abu Ali told Ma’an. Four farmers had gone to check their lands near Mikhmas village after reports that settlers had cut down around 150 olive trees, village council official Muhammad Kanan said. The farmers were attacked as they arrived at their land, with 30 settlers lying in wait. They all managed to escape apart from Abed al-Kareem Maikel Abu Ali, who was subsequently beaten by the group of settlers for around 40 minutes, Kanan said.